It’s a really good list. However, I noticed you listed tarantulas that can live in temperatures from 60-80 degrees. I’m from Texas, my house is easily 80-90 degrees on average in the summer, and gets around 70 as the coldest in winter. Hello, Aravis! Unfortunately, the majority of the species available can tolerate temps in the 90s for a bit, but it can be unhealthy for them in the long run. There are obviously species that live in areas that experience high temps, but they will seek refuge in cooler burrows and come out at night to hunt. Is it often 90 in the summer, or is that on occasion? The species that do better in temps that high would not be categorized as “beginners”. Tarantulas like the “baboon” species (the OBT, M. balfouri, and other African species hail from areas that experience extreme heat and seem to do better in warmer temps. Again, though, they are burrowers. If the temps only seldom hit 90 in your home, you’d be fine with most of the species on this list. Or, if there is a cooler room, that would work. Sustained temperatures in the 90s might be a bit too much, though. Low to mid-80s would be fine. I really appreciate that you include some “non-conformist” species on your list (as compared to most other “beginners” lists)! 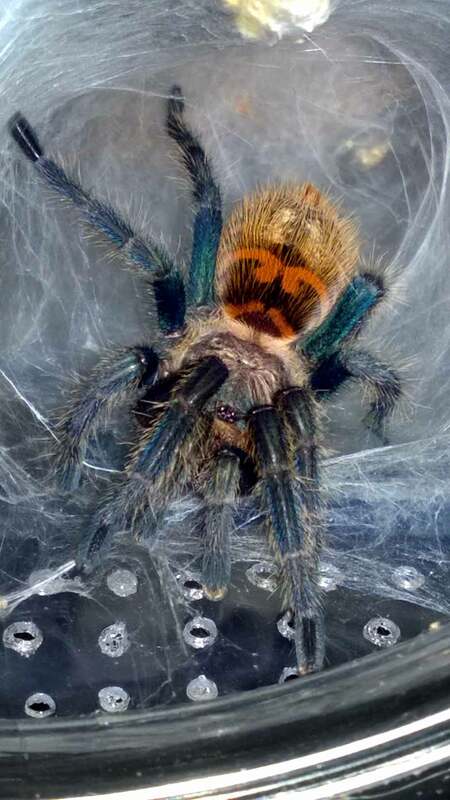 I never wanted a tarantula until I saw a G. pulchra and fell in love, and suddenly all T’s are beautiful/cute instead of “cool for like 5 minutes but then start getting creepy”. 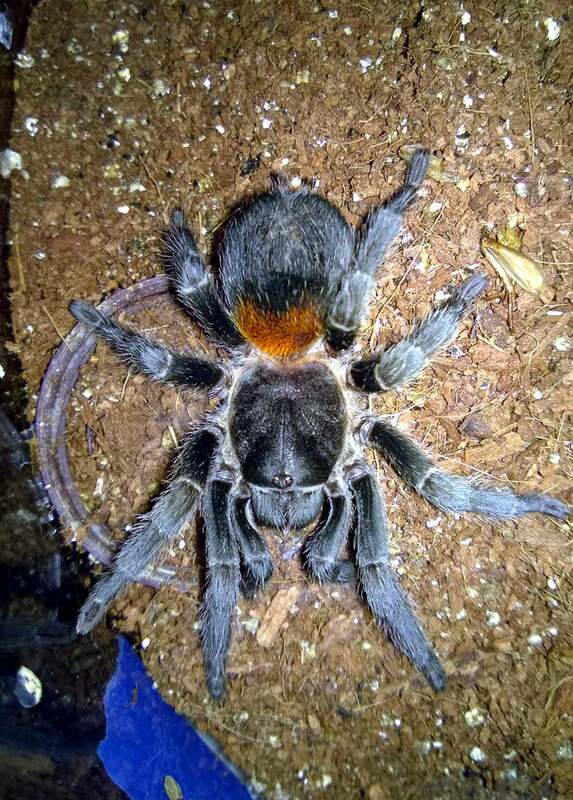 I have my heart set on the G. pulchra being my first, but if that turns out to be unlikely due to lack of affordable availability, I really have no interest in turning to G. rosea or B. albopilosum instead. Thanks to you I have have E. sp “red” , E. parvulus, and the pink zebra beauty (sorry but I don’t have that scientific name memorized yet lmao) on my back-up list. … But of course it seems like those might not be so easy to find either, argh! Thank you! That list will probably continue to grow and evolve over the years. When I find one that I think can make a good beginner, I try to find out what other hobbyists experience with it. Still, every specimen is different, so one keeper’s sweetheart can be another’s monster! You should be able to find a G. pulchra if you keep a lookout. They aren’t quite as prevalent as B. albos or G. pulchripes, but they definitely pop up quite a bit. Hopefully, you find one when the time comes! And, yes…the other three probably a bit more difficult to find that some other beginner species. Thanks! From this list, and a few others, as well as after watching some videos I’d say I’m between the Mexican Red Knee and the Curly Hair. The curly hair from videos seems to have no cares in the world about anything and just seem so laid back with their owners working in their cages or handling them. The Mexican Red Knee though are real lookers and I understand are good for displays, with adults chilling in the open often. Question is I’m wondering how often the curly hairs are out in the open, even if just sitting on top of their hide, and I’m also wondering how much webbing both species do? My curly hairs tend to be out in the open quite a bit, especially once they hit around 2.5″ or so. Mexican red knees can be very skittish and shy until they get larger. Mine is about 4.5″ or so now, and she’s still a bit skittish. They are also a bit more likely to hair if disturbed (although they usually outgrow this). Where do you get your spiders? Thank you I’ve been looking at fear nots selection and I’m hoping to get my first t soon! I have done a lot of research and I have decided that a grammostola pulchra would be the perfect first tarantula for me. The only problem is I live in the US and it seems darn near impossible to find one here. 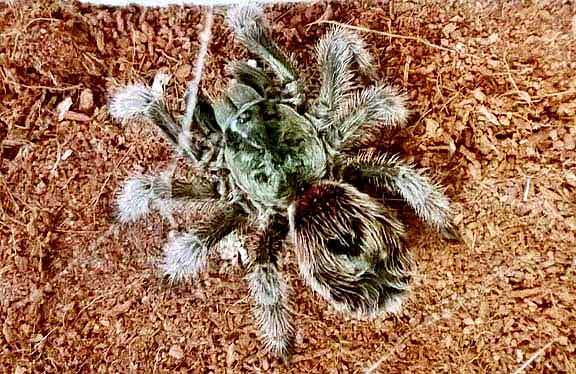 Being an experienced keeper, do you know of anyone who is breeding/selling these beautiful tarantulas? Man, I see what you mean. They are literally impossible to find! Fear Not Tarantulas has slings, but they’re $90! Wow. Hopefully, someone starts breeding these soon. When I bought mine 4 years ago, I only paid $35 for it. Whitch one to get. The red rump look good but I don’t know what to get can somebody please help me. I am lookinf for a T that I can handle with my hand without a problem. Hi, Cooper! Nothing on this list got your attention? The two species that are usually open to handling are the Euathlus sp. red and B. albopilosum. Hey, so I’ve just found you and your page/videos. All of your spiders are gorgeous and you seems to really enjoy what you do. I do have a question though, I have an L.P female and she had been fasting for a little over 2 months now. Which, after watching your video on L.Ps, particularly the part where you say they’re voracious eaters, I’m now worried about ours. She refuses to eat, but she looks as though she’s in premolt, and has looked that way for quite a while. I suppose I’m wondering whether I need to try and find help for her, or whether she’s ok.
What size is she? They are voracious eaters, but they will stop eating when in premolt. Larger specimens can take quite a while from when they stop eating until they finally molt. My big girl (she’s about 8″), took four months last time. Let me know, and I’ll try to help! Which one is the fastest growing spicies on the list? One that I would add to the list (although I would classify this as hands off, along with 9 and 10) is Acanthoscurria geniculata. Very hardy species that starts to show its adult colors at a small size, grows fairly quickly and has a voracious appetite. Although I have seen some keepers with calm specimens that they free handle, I wouldn’t recommend it with this species. That species will probably get added in the next revision. I thought about putting it on there, and I’ve had plenty of folks say it should be added. I think I’m going to do a “hands off” beginner list next. 🙂 Thank you! 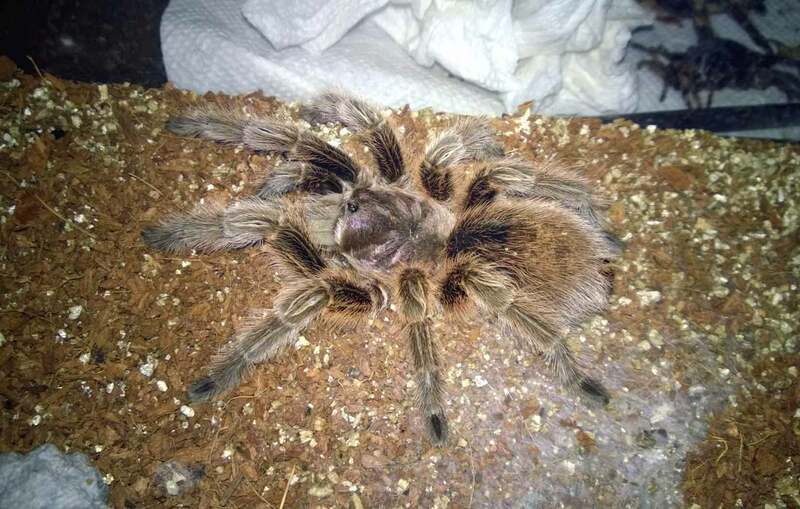 Hi, I´m from Paraguai and I really want to have a tarantula but where I live the temperature is usually over 84°F and sometimes it is over 100°F. So will I need to have the AR on, all the time? Hello, Alan! So sorry for the delay. I just found this! Most species will do fine in 84, but you’ll want to move them to a cooler room if it hits 100. That could kill them. 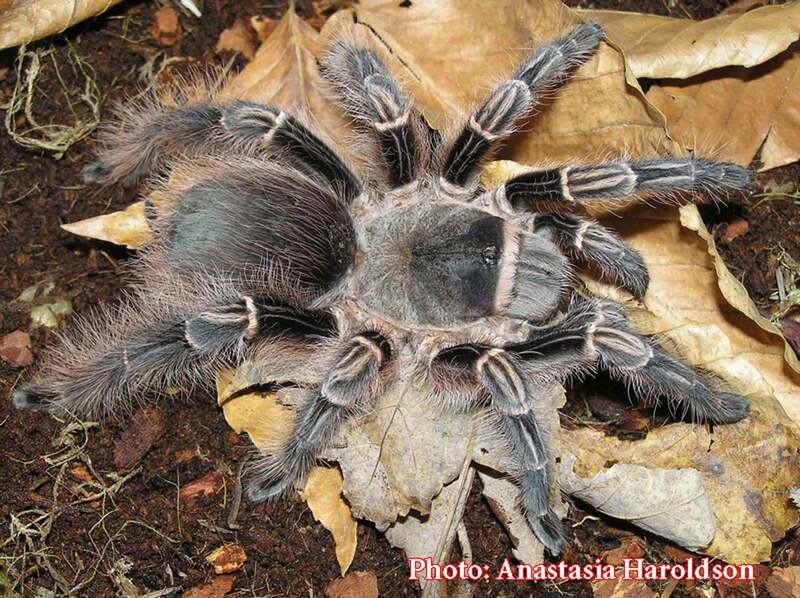 Hi, I live in Costa Rica and I’m thinking to get a Aphonopelma seemanni (Costa Rican Zebra) as a starter. Is this a good Idea? I have a question. Has any of the ones that you mentioned bite you, because I want one of these ones but I have a little fear that it might or might not bite me. This is the only species I handle on occasion, and they have never bitten me. Hi Tom! I just wanted to say a huge thank you for everything you do for this hobby. I got in the hobby last week and I don’t believe I would even be 1/3rd as confident without all your videos and articles! I watched pretty much all your channel and read all your blogs, and I feel I have a good grasp on doing things properly. I am now the the father of two slings, B, Albopilosum and L. Parahybana (which I know will get quite large, but it will take a couple years, it is so tiny now)! 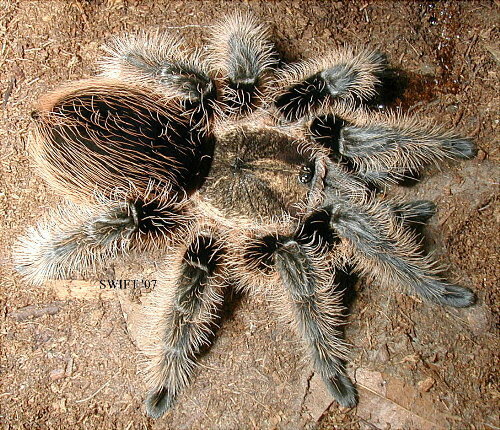 I get a lot of mine from Fear Not Tarantulas and Jamie’s Tarantulas. Palp Friction and Swifts Invertebrates are two other great places to buy them from. 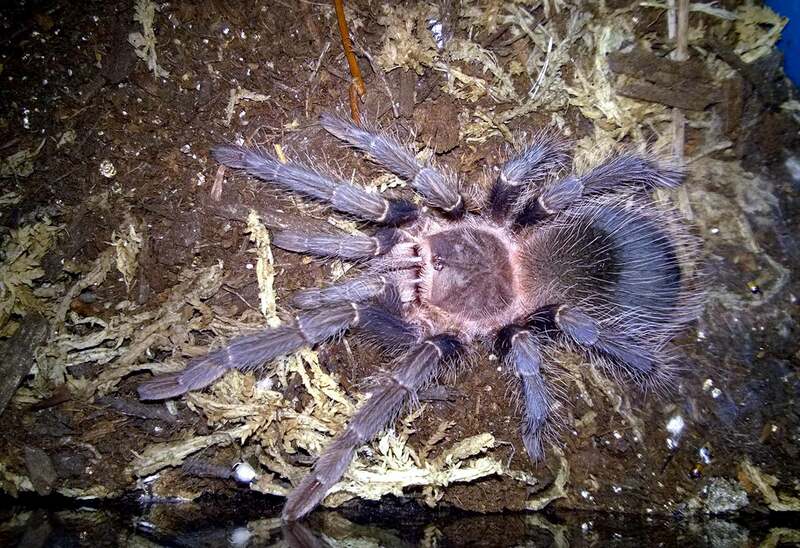 I’m looking to get into the hobby and while I don’t personally own one yet, the ones I didn’t see here that made it on my list is the Aphonopelma hentzi (aka: Texas Brown) and Brachypelma albopilosum (aka: Honduras Curly Hair). 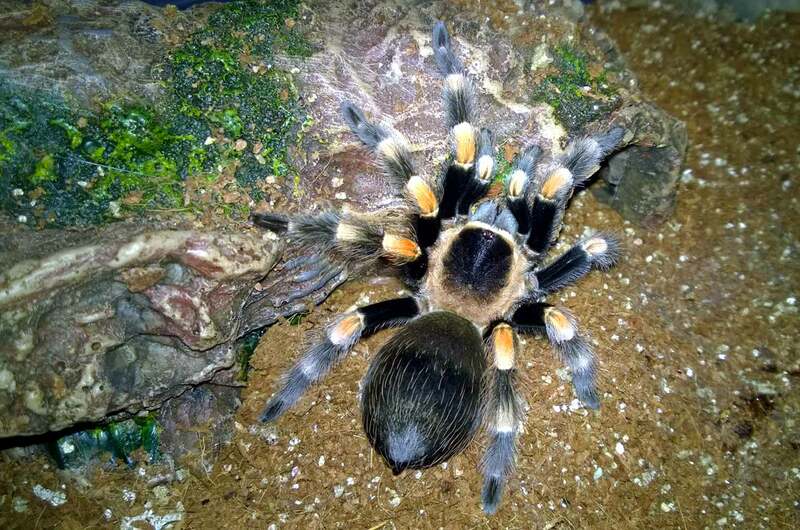 One of the ones you mentioned, that I would die to get my hands on is a Euathlus sp. red (Dwarf Chilean Flame), because of their beautiful markings, their inquisitive nature and of course their disposition when being handled. The Texas Brown made it on my list, because one I live in Oklahoma and so naturally hitting so close to home I feel like the natural tempatures would help aid my care since they can actually be found here. I’ve read a lot about people coming across them naturally and they found them to be passive enough to approach up close or even pick up. I like there beautiful natural shade of brown. I mean really I could easily list a ton of reasons I felt drawn to this beautiful creature. Though back on track. The Honduras Curly hair attracted me, because they seem to be virtually indestructible. Somewhat slow moving. Appear to be easy to handle. Though if course with such out of control hair, they are abso-friggin’-loutely adorable! ^_^ Anyway I’ll end the rant here. Just wanted your opinion on these unmentioned specimens and wondered why they did not make it on your list. How about the Mexican Red Leg Tarantula and Brazilian Red & White ?? Sorry for the delay…I missed a bunch of comments! Either one of them can work if your aware that they can be a bit more skittish than some of the others on the list. Wow thank you so much for this guide! After ten years of battling my mother against having a tarantula a few nights out of the blue she finally said I could have one. I am now doing research and I discovered this well written educational guide I want a tarantula that does not mind being handled and is good for a newbie like me, this guide has really given me direction. Hi, Cody! So sorry for the delay! I haven’t been getting comment notifications! Congrats on convincing your mom to let you have one…that’s great! Mine would never cave in. haha Do you know which species you’re looking to get? Hey I was wondering if you have ever owned a peocilotheria regalis and if they are hard to care for? I was thinking if they were hard to take care of or what because I LOVE the look of them. A geniculata also makes a good first one for virtually the same reasons the LP is, just being a little smaller and more colorful. They are just as “pouncy” as an LP if not more so. I will be adding A. geniculata in the next revision…thanks! Thanks to stumbling across your YouTube vids while researching info on ASF rats last week I’m now back in the Tarantula hobby. I just unboxed and housed two beautiful specimens of B. harmorii/smithi. I selected Jamie’s Tarantulas from one of your vids and couldn’t be happier with the whole process. Those guys are great! I’d like to send you over a few pics and a small vid of some of the behaviors these guys are doing. If you would like to reply to my email address I can shoot these over. Thanks for putting up this great information! Hello, Jerry…so sorry for the delay! Congrats on your new spiders…that’s awesome! Please feel free to send pics to tomsbigspiders@outlook.com. Hi Tom, I’m new to tarantulas and reading through your articles and they are very helpfull. I just catch one last week (Baja California, Mexico), and I’m trying to adapt its new home, but, I would like to know what specie it is. Can you help me with that? Hello, Andrea! Can you email me a couple photos at tomsbigspiders@outlook.com? It’s an Aphonopelma species…I’m just trying to figure out which one! Hi, first of all, just want to say thanks for all the work you’ve put into your site and videos. They’re a huge help to someone looking to get into the hobby like myself. I’m currently deciding on my first and was hoping you could help me finalize my decision. I just had a few other questions that I was hoping you could answer. First of all, I’m from the Philippines, and will probably be keeping my Tarantula in my room (since the rest of the household are rather arachnophobic) The days here are pretty humid, (maybe 75-90 degrees) but at night I have the air conditioner on at around 65. Would that be an okay environment for a tarantula, assuming that I have an unheated setup but have enough dirt for a sling to burrow and a hide. Second, any thoughts on a d. pentaloris/ fasciatus/ tiger rump? I really love your husbandry videos, but this seems to be one of the few that you haven’t done one on yet. I’m just wondering if it’s beginner friendly since it is one of the most attractive types available locally. Lastly, are there any other heavy webbers that are good for beginners? The GBB would be perfect, but alas, I can’t seem to find one locally. Johnathan! Can you send me an email at tomsbigspiders@outlook.com? I’m trying to write a long response, but the comment section is acting up. Sorry for the delay! Fear Not Tarantulas, Jamie’s Tarantulas, Pinchers and Pokies, Ken the Bug Guy, Swift’s Inverts are good places to start.